Vitamin B12 | Become Healthy or Extinct! 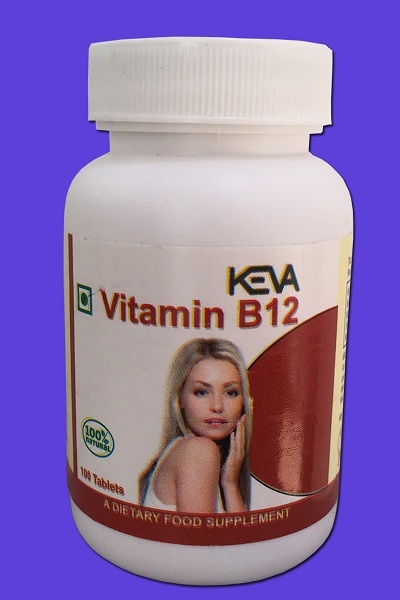 Description: Keva Vitamin B12 tablets has been introduced which is known to possess various health benefits. Vitamin B12 is a water-soluble vitamin, which plays an important role in metabolism of fats, carbohydrates and protein. Essential for normal formation of blood cells and contributes to the health of the nervous system. Ingredients: Vitamin B12, Folic Acid, Herbal propitiatory blend, Stearic acid, Dicalcium Phosphate. Directions for use: Please take 1 tablet twice a day morning & evening on an empty stomach or half an hour before meal.